In this review I look at two 16x2 LCD modules at opposite ends of the price spectrum. Both have very similar display modules, both is size and visual clarity. That is quite a difference in price spread, with the Freetronics device being almost twice the price of the DFRobot shield. * Extra long headers mean it will fit onto an Ethernet Shield. 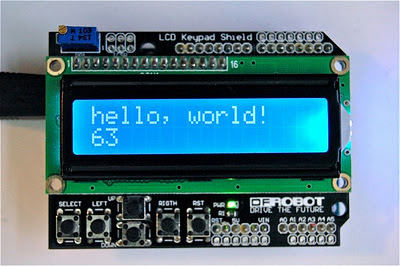 * Pins used and init string for LCD are marked on the board itself. * LCD Module firmly attached with nuts and bolts. My only dislikes are that the in the module I received, the trim-pot used to adjust the contrast of the display was not included on the board. This could easily be added, and the 'default' contrast was okay, but I would have preferred this component to be included. The DFRobot shield is very good value, but there are a few features that let it down. 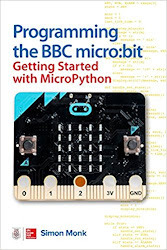 This first feature was a problem for me, because I bought it with the intention of attaching it to an Ethernet Shield to display my current book Amazon ranking (yes, I know, the vanity of the man!). No conflict in the main control pins, so fine I thought. Unfortunately, the DFRobot module uses D10 for backlight which is used as SPI CS on Ethernet shield. In addition, while the board fits snuggly on an Arduino Uno, the pins are to short to fit square on an Ethernet shield. The height of the trim-pot causes a problem because it sticks up to the same height as the LCD panel, so I think it would be difficult to mount it in a case with a cutout and bezel for the display. 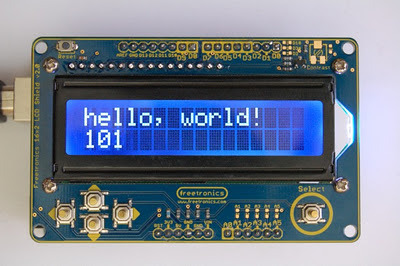 In conclusion, if you need a low cost display shield and you are not using an Ethernet shield or worried about fitting it in a box then buy the DFRobot shield, otherwise, go for the much better designed and built Freetronics shield. You will find many other LCD shields out there too, but when selecting one, be careful to check for pin compatibility with any other shields that you may be using. Disclosure: While I have tried to be completely unbiassed in this review, I do need to point out that the Freetronics module was provided to me free of charge from Freetronics. Nice review of these LCD shields. Have you any idea of the current consumption of each? That's always useful to keep in mind for battery powered projects. I sent some PCBs for fabrication to Iteadstudio and took advantage of their open-source PCB offer; they make extra boards which are given to two random customers and you receive two different random boards in return. One of the boards I received was a Camera Axe shield. I'm thinking of using it as an LCD shield. There is space for 9 buttons. Instead of the 16x2 LCD display it uses a 128x64 graphic display. The big disadvantage compared to the boards you review here is the cost, the display itself is £23. This shield is using only one pin for the joystick and is I2C managed. I hope you'll add it to your test. If you want to send me a shield for review, I would be more than happy to add it into the mix. Si. That review is great i am influence by the maker.He made the Scrolling display with arduino and hope so energy consumption is very low.